I mentioned the other week that I seem to have unblocked as far as reading is concerned. After months of reading very little, I'm suddenly on a roll. Perhaps this has made me somewhat overconfident, but I've embarked upon a grand reading folly. 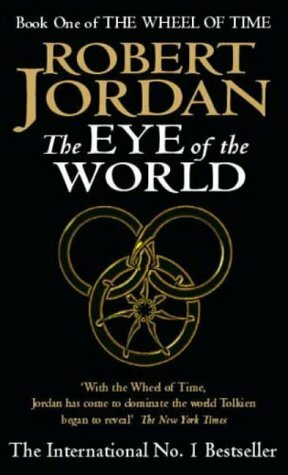 Last week I ripped my way through Robert Jordan's "The Eye of the World", the first in the fourteen book Wheel of Time saga. Fourteen books. That's apparently a little over four million words. If I think about that too hard then I might just be too intimidated to read a word further. I'm not embarking on this journey alone: Alecya is with me, and Steve was toying with the idea too (join us, Steve.... you know you want to! Actually, all welcome. Still time to catch up!). Well, anyway. I had a good week of reading last week: C. was away -- technically on holiday, but actually in Brighton conducting some sort of experiment for her Open University psychology degree. Apparently this is how the woman relaxes. Anyway, this meant I had plenty of time to just sit and read. I've sort of been meaning to use time like this to start playing the most recent Tomb Raider game, but apart from watching a couple of films after she left last weekend*. I've not even turned the telly on. I've got home, read, had my tea, read, gone to bed, read, slept. ...if this isn't a good sign about the book you're reading, then I really don't know what is. I like the genre, but I really wasn't sure at first. The spectre of Tolkien looms large over many books like this, but the flight from a comfortable home pursued by relentless riders and including an escape over a ford? Stop me if you've heard this one before. 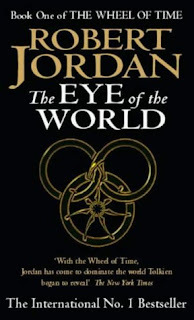 There was enough there to keep me reading though: this world has massive scope and a structure all of its own that kept me interested enough to keep going. I was quickly rewarded by large sections of the book that are almost unbearably tense. It's gripping. In theory, I was watching the cricket on Saturday and Sunday, but in practice it was just on in the background as I pushed on towards the finish of the first book and went straight into book 2. I've got a long train ride to and from Exeter tomorrow - something like an 8 hour round trip - and if my colleagues don't want to do anything tedious like make conversation or do some work, I fully intend to use as much of that time as I can reading. You can't beat a good book. If you know there's a sequence of thirteen still to come after this one, then so much the better. * Dredd and The Hobbit. We've both seen the Hobbit already, but as always seems to be the case with films I watch in her absence, it was her heart's dearest desire to watch Mega City One's ruthless lawman administer justice. Go figure**. I also watched Zombieland again the following weekend, but she didn't seem fussed by that. ** For some reason that I haven't quite fathomed, she's also very keen to see The Wolverine.... she very much enjoyed the trailers we've seen, anyway. Must be her deep love of Marvel comics and their accompanying film adaptations, right? Right***? **** Well, they are excellent. I really liked it, although to be honest I thought it was basically the same story as that (excellent) Indonesian film "The Raid" (which, if you haven't seen, you really should check it out). Karl Urban was a pretty good Dredd though, and Alex "the beach" Garland did a decent enough job with the script (copying notwithstanding). Nice to see Cersei Lannister stretching herself with another sour villainess too. The ultimate compliment, I suppose, was from my mate Rich who has subscribed to 2000ad for the last twenty-odd years. He really liked it. Nuff said. Haven't seen The Raid but I'll go check it out thanks. And, yes, I also read 2000AD from 1980 to 2000ish.